What would you typically be doing on a Saturday morning? Sleeping in? Running errands? Watching cartoons? There’s a Saturday in May where something extraordinary is happening, and you can be part of making positive changes in South Allison Hill and beyond. On Saturday, May 18, 2019, 9am at Harrisburg Area Community College (Main Campus, One HACC Dr., Harrisburg), Highmark will again sponsor their life-giving Highmark Walk for a Healthy Community (5k Walk or 1 mile Fun Walk). Click Here to Register or Donate to bcmPEACE through the Highmark Walk. 48 local nonprofit organizations have the opportunity – at no cost to them – to raise awareness, support and money for their causes. Highmark underwrites the event so that charities can keep all fundraising proceeds. bcmPEACE (Brethren Community Ministries) is one of those organizations, and the Highmark Walk is our biggest fundraiser of the year! Our goal this year is to raise $15,000. Registration begins at 7:45am and the 5k Walk and 1 mile Fun Walk start at 9am sharp so arrive early. By becoming a Walker, a Team Leader, or a Virtual Walker (fundraising partner), you are helping bcmPEACE to continue and even increase its effective ministry in the city of Harrisburg. bcmPEACE’s mission is to serve “Allison Hill in becoming a safer, healthier community, empowered by God’s peace.” This mission is achieved by ministry partners like you as you financially support bcmPEACE, volunteer for bcmPEACE programs, spread the message of bcmPEACE through word-of-mouth, and empower bcmPEACE through your faithful prayers and service. The Highmark Walk is one of many ways to demonstrate your support for the work of bcmPEACE; work that includes feeding families, educating community youth in the ways of nonviolence, guiding parents, empowering citizens with computer classes and other life skills, and keeping kids safe through our KIDS Club. Start your own walk team, to join an existing team, or to make a donation. Use the next several weeks to raise funds and recruit walkers or virtual walkers, and then join us for an extraordinary Saturday in May where we all together can make a world of difference in our community. We are looking for companies and other entities to sponsor us so we can continue our community transforming initiatives. Go to bit.ly/Walk2019Sponsor and download our Sponsor form and make a pledge. We can collect donations until June 28, 2019. HACC, Pennsylvania’s Community College, is located at 1 HACC Drive in Harrisburg, Pa. just off of Cameron Street. Get directions from your location. 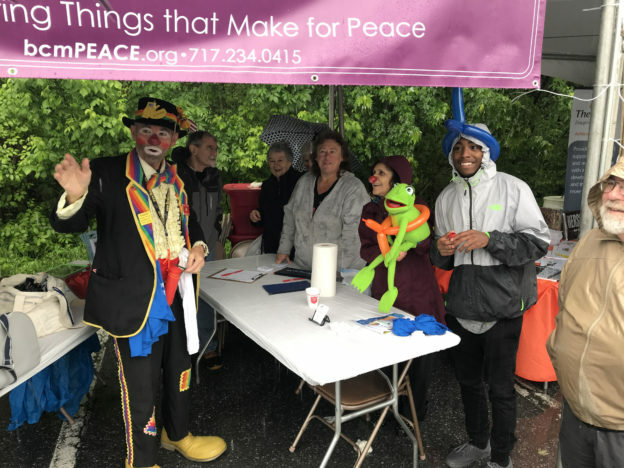 This entry was posted in Event and tagged bcmPEACE, Be the Peace, Highmark Walk, Walk on March 21, 2019 by bcm2010.